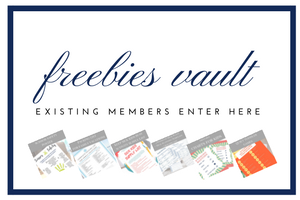 Inside: Find a 30-day free printable parenting journal to help you maximize your time with your children. Imagine this: It’s almost dinner time and your toddler wakes up from her nap groggy. You change her diaper and carry your baby into the kitchen to begin cooking. Your toddler is waiting at the top of the stairs begging you to carry her too. You set your hungry baby down for a moment, and he instantly begins crying. As soon as you are down the stairs you are already thinking of the order in which you need to prepare dinner, but now your toddler is saying she needs you to hold her and your baby is still crying. You glance at the clock to see you should have started cooking a while ago. You try to fill a cup with milk, balancing two little ones in your arms, and your baby hits the milk jug just right, splashing an avalanche of milk onto the floor. This is when you are tempted to hit your breaking point. You have only moments to decide. Situations like this play out all day long, which is precisely why I have created the simple 30-day parenting challenge to maximize your time with your children, including a FREE journal. 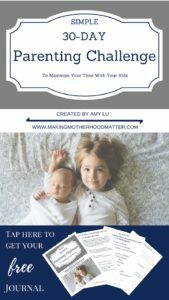 I created this simple 30-day parenting challenge for parents who want to be proactive about making each day count with their children. By joining the 30-Day Parenting Challenge to Maximize Your Time With Your Children, you are setting yourself up to create positive parenting decisions. In under five minutes a day, this challenge will empower you to select a custom parenting goal each day, pick a time to implement the goal, and then reflect on how you did. Each night, you will select a new goal for the next day. So, when you wake up, you will be ready to go. What is Included in the Simple 30-Day Parenting Challenge? I will be patient with my child today. I will use a calm voice with my child today. I will compliment my child on something he/she does well today. I will make time to play with my child today. Five minutes or less of planning/reflecting and whatever time you decide to commit to spending with your child or children. Are there any hidden fees or strings attached? Nope. No fees. No strings. Parents with children of any age who want to maximize your time with your children by selecting simple goals to implement. How can I get the most from this challenge? Join the amazingly supportive Facebook Group, Balanced Mommies, a community of moms with young children, to keep yourself accountable and give/get support from a community of parents like you. Place your journal in a highly visible area, so you can see your goal each morning. Sign up to receive your FREE 30-day parenting challenge journal here. Set aside less than 5 minutes a day to select a goal, pick a time, and reflect. Join the amazingly supportive Facebook group for accountability and support. Place your journal in a highly visible area. Get excited that you are taking actionable steps to maximize your time with your children! Good luck! I can’t wait to hear how your journey unfolds. P.S. You may also like Toddler Tantrums: 3 Powerful Secrets for Calming Big Emotions. I love, love this so I may be joining! Unfortunately my pregnancy emotions have made me less than patient at times and I want to be held accountable for it throughout this summer! Thanks for sharing! Love this. I was hoping to do something like this, this summer but I never got to it , and the summer is almost over. ?